Dogwood trees (Cornus spp.) are cherished for long-lasting spring blooms of pink, white or red. 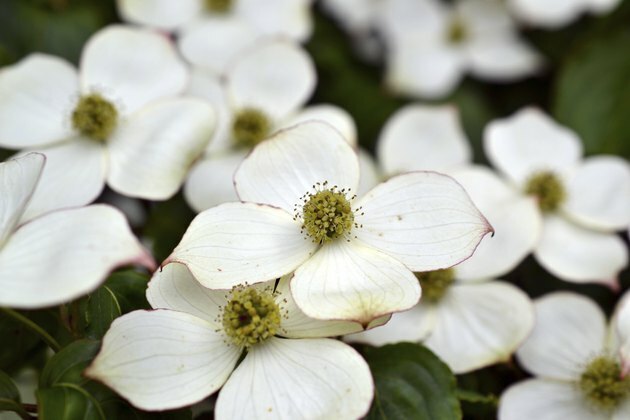 Depending on their species, dogwoods thrive from U.S. Department of Agriculture plant hardiness zone 3 through 9. To ensure the health of your dogwood tree, grow it in rich, well-drained soil with dappled light and plenty of air circulation. These conditions discourage the few diseases and insect pests that occasionally afflict dogwood, causing leaves to turn brown. A close-up of healthy dogwood blooms. Ascochyta cornicola is a fungus that appears on dogwood foliage after unusually rainy springs, attacking new leaves as they emerge. Blight begins with small, brown-centered, gray spots that appear on leaf surfaces and distort leaf growth. The entire leaf is eventually engulfed, turns brown and black, then withers. To treat Aschochyta blight apply a copper-based fungicide when leaves begin to emerge, and again in midsummer if the weather remains unusually wet and cool. Rake up dead and infected leaves and dispose of them in yard waste bags to prevent further infection or spread to other trees. Dogwood anthracnose is the most common disease that affects dogwood trees. Caused by the fungus Discula destructiva, anthracnose thrives in moist shade. Symptoms begin on leaf borders with purplish blotches that eventually cover the leaf. This disease can spread up the leaf stem and infect the twigs, bark and trunk, eventually killing the tree if left untreated. Treat with copper-based fungicide and by pruning and discarding infected leaves and branches. Wear gloves and safety goggles when pruning. To prevent the spread of disease, sterilize your pruning blades with household disinfectant before and after each cut. Septoria cornicola is another fungus affecting dogwoods. It appears on dogwood leaves in late summer, with purplish, irregularly-shaped spots that have small veins radiating from the center. The disease seldom kills the tree, but it distorts the leaves late in the growing season. Because of its late development, the best treatment is to simply rake up leaves when they fall to remove the fungus and knock back its ability to reproduce. Dispose of the foliage, and never compost the debris. The fungus can overwinter. Leaf scorch affects dogwood when cultural needs are not being met. Hot, dry and sunny weather burns leaves, causing them to turn yellow, then brown at the edges. Leaves eventually curl and drop. Grow dogwoods in light shade, with shelter from harsh winds. Ensure your dogwood receives enough moisture. Check the soil and make sure water is penetrating to the roots and not simply running off. Spread mulch in a 3-foot ring, 3 to 4 inches deep, keeping it 2 to 3 inches away from the trunk. The mulch helps hold soil moisture during periods of drought. When dogwood diseases call for fungicides, copper-based sprays handle infections well. Start treatment as soon as diseases appear. Mix 1.5 to 2.0 fluid ounces of liquid copper concentrate with 1 gallon of water -- use the higher rate for diseases that overwinter or when symptoms are severe and spreading rapidly. Spray all the leaf surfaces thoroughly, both top and bottom, and repeat every seven to 10 days. Reapply after heavy rain. Wear gloves, protective clothing and safety goggles when mixing and spraying fungicides, and keep the area clear of people and pets. What Are the Causes of the Little Brown Spots on Apricots?